Why don't we go and look at that message we received a while ago. Click on the piece of paper to the right and click on the message "Welcome to Travian". Well, isn't that nice. Now that you have started playing, your beginner's protection has started to decrease, so it is a good idea to start building soon. Editor's note: The length of beginner's protection increases as the server ages. Signing up on old servers gives a longer beginner's protection than signing up on newer servers, but is more dangerous. Yes, I said it, we are actually going to build now! Yay for you! Lets head over to the village overview by clicking the button with all the little numbers in the coloured 6 sided squares. Now that we are back to the village overview, take a look around the small picture there. Do you see the tan circles? Those are where your resources are coming from. Right now, you are not getting a lot from them, but as you level them higher, you will get more from them. Have more resources is what that message was talking about right? So lets level up one of our wheat fields. Do you see the the crop space that I circled red? Go ahead and click that. Well, you won't see exactly that, but you will see something close to it. 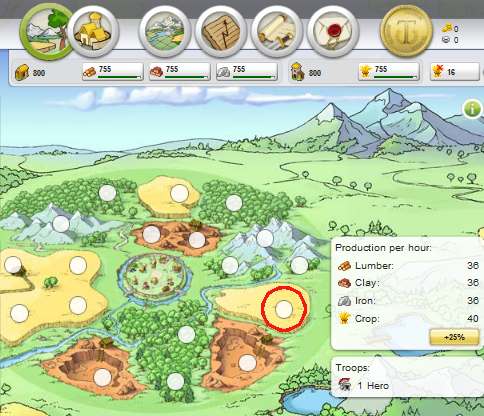 As Travian is nice to beginners the first cropland is instantly finished as reward to the beginners tasks. TADA! You now are the proud owner of a level 1 cropland! You can see that your crop production has increased, so that you are now making more crop per hour.